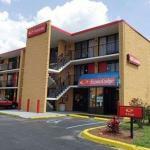 Free Wi-Fi and breakfast plus an I-77 location near the Galleria equal major convenience at the Econo Lodge Rock Hill. At the three-story Econo Lodge all 59 rooms feature free Wi-Fi desks and flat-panel TVs with HBO and non-smoking rooms are available. Mornings kick off with free breakfast and there are ice and vending machines on-site for handy snacking. Fax and copy services are also available. Parking is free and pets are allowed for a fee. The Econo Lodge is off I-77 less than a half-mile from a variety of quick bites and within a five-mile drive north of central Rock Hill. It's shop-till-you-drop time less than four miles south at the Rock Hill Galleria. Guests can head to the great outdoors a 10-minute drive away at Glencairn Garden or take a four-mile swing over to Waterford Golf Club. Charlotte Douglas International Airport is 22 miles north of the hotel.